I'm not sure if floral designer Lindsey Taylor actually traveled to Moscow to visit the Pushkin Museum of Fine Arts. Perhaps, not. But whether she saw the original Vincent van Gogh's 1888 painting or its reproduction, "The Red Vineyards at Arles" became an inspiration for her arrangement. "Long ago, when my parents' summer cookout menus dictated a lot of mustard and ketchup, I developed a bias against pairing the colors red and yellow. I was more of a relish girl." However, when we keep our minds--and eyes--open, unexpected things happen. We begin to see beyond the bold reds and yellows, noticing the subtle colors -- the small details that help us understand the big picture. "I noticed how some of the quieter, and cooler, hues help mellow the harshness of the red and yellow," Lindsey says, "Note the periwinkle blue of the field workers' uniforms and the creamy white brush strokes that accent the field, the sky above and its reflection in the water. Without these touches, the painting might have been too strident." If you like Lindsey Taylor have a "lifelong prejudice against red-and-yellow," throw in a few more colors, and "paint" your own bouquet, or flower garden, or anything you care to create. For you never know where inspiration will take you. P.S. 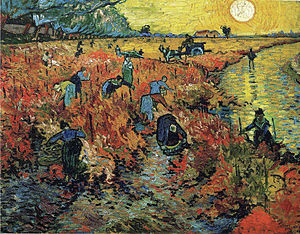 "The Red Vineyards at Arles" is believed to be the only painting by Vincent van Gogh that was sold while the artist was alive. P.P.S. The post was inspired by the article "VAN GOGH IN A VASE" published in The Wall Street Journal (Aug. 15-16, 2015). A lot of rain here, too. I think Wednesday's supposed to be sunny and warm.